VOX is a member-led organisation and our strength lies in our members’ knowledge, experience and commitment. New members are always welcome and can join as individuals, groups or associates. Click on any of the boxes below to learn about VOX individual membership, group membership and associate membership. 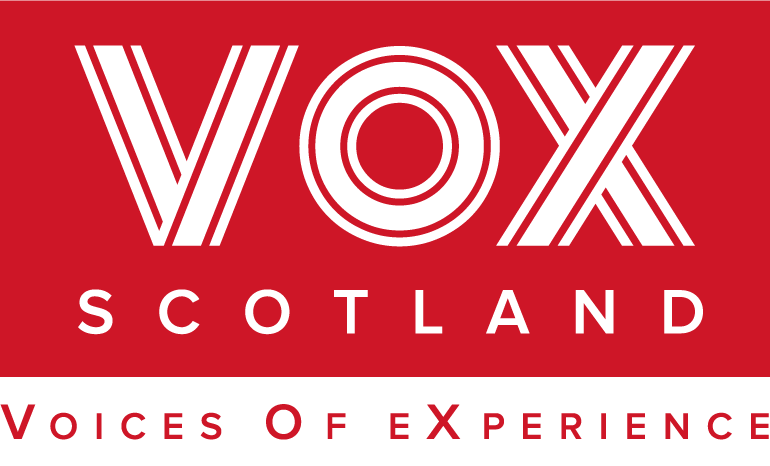 VOX is a member-led organisation, and VOX members shape VOX values and priorities by attending our two national members’ meetings per year, contributing to VOX research and/or standing for election to the VOX Board. Anyone with a lived experience of mental illness (past or present) can join and a formal diagnosis is not required. Individual members can attend two national members’ meetings per year (the September AGM and the Jan/Feb winter meeting), receive copies of our regular newsletter and access training and capacity-building events. VOX members can also contribute to VOX research and consultation and can represent VOX and other individuals with mental health issues on bodies such as Holyrood’s Mental Health Cross Party Group, the Independent Living In Scotland Project Development Steering Group, Royal College of Psychiatrists, the Mental Welfare Commission Practice Network and the Peer Support Development Group. VOX Membership is free and we reimburse members’ travelling expenses when they attend VOX national members’ meetings or other VOX-endorsed events. Joining VOX will not leave you out of pocket and you can read our expenses policy here – VOX operates within the Mental Health Foundation (MHF) and uses the MHF Expenses Policy for guidance. Join VOX by completing the online application form or contact the office to request a membership application form. The VOX Board considers membership applications at its regular monthly meetings and is welcoming and inclusive. You’ll be notified of your membership shortly after it’s been approved. Mental health groups led by service users and/or individuals with a lived experience of mental illness can join VOX as group members. Group membership allows several members from the group to attend VOX events and cast a collective vote on behalf of their organisation on AGM resolutions. Join VOX by completing the group membership application form (Word document format) or (PDF format) and returning it to our office. Alternatively, contact our office to request a group membership application form and/or ask any questions you may have about VOX. The Board considers group membership applications at its regular monthly meetings and is welcoming and inclusive. You’ll be notified of your group membership shortly after it’s been approved. Mental health groups led by service providers, volunteers or carers can join VOX as Associate Group Members. Associate Group Members enjoy many of the benefits of Group Members but – reflecting VOX’s remit as a service user-led organisation – can’t vote on AGM resolutions. Join VOX by completing the associate member application form (Word document format) or (PDF format) and returning it to our office. Alternatively, contact our office to request an Associate Membership application form and/or ask any questions you may have about VOX. The Board considers associate group membership applications at its regular monthly meetings and is welcoming and inclusive. You’ll be notified of your associate group membership shortly after it’s been approved.